For the past few months my eyes have been drawn to yet another hobby. I’ve been dreaming about stitching. Stitching beautiful things like those made by Soule Mama, Heather Hales Designs, Wee Wonderfuls, Sublime Stitching and Merwing. Yesterday I finally got myself to ACMoore and made a few purchases. I bought a hoop and some embroidery floss. I bought some needles too but I’m not quite sure they’re the right kind for this. I browsed around to find a simple design I could try and found this free pattern on Heather Hales Design flickr account. I copied it onto some fabric from the stash and now I’m all set to try! 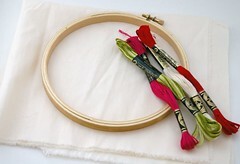 I’ll be using the How-To section of Sublime Stitching to get myself started. I’m hoping to be able to find this Stitch-It kit at the book store soon too as it would be a great help. I really would love to be able to stitch something like this soon! 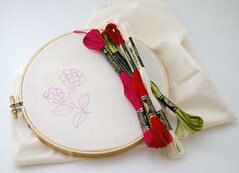 If you’re a stitcher and have tips for me, I’d love to hear about them! Ah thanks! I’m SO glad people are using the patterns!! My all time favorite book for stitching is The Complete Encyclopedia of Stitchery it is great for all types of stitching, but it has a very complete list (with instructions) of all sorts of embroidery stitches- more than I ever knew existed!! I embroidered pillowcases when I was a kid – which I slept on last night. If you decide to do a set of pillowcases, buy a good set and iron a pattern on. Don’t use the pre-designed kits you can buy because the pillowcases are usually really cheap and you don’t want to do all that work on something that will fall apart. Have fun!